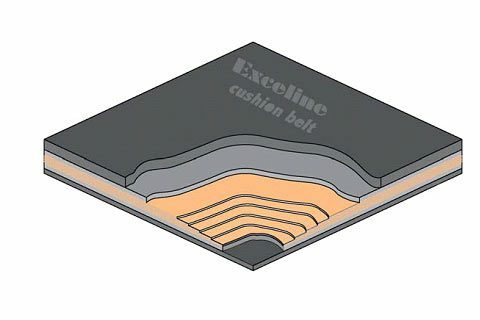 Belts manufactured with low friction coefficients on their top side. This fabric makes sliding on a flat surface easier. These belts have a rough textured top cover. This prevents material from sliding on the belt. Particularly suitable for inclined belting of parcels and sacks. These belts are particularly indicated for the transportation of large productions, heavy duty applications requiring significant width dimensions or belts with an anti-break resistance. 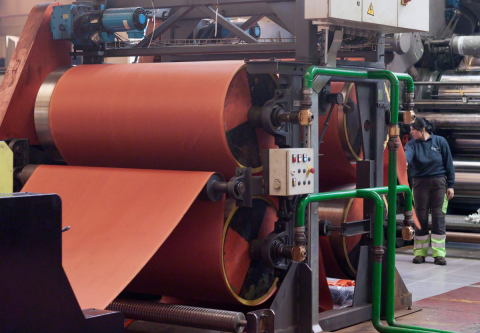 Beltsiflex® presents the manufacturing of a new fabric used to fabricate conveyor belts called Straight Warp, a new concept for rubber belts. Hard-Woven belts are manufactured out of this new Straight Warp fabric and have several advantages over conventional EP fabric belts, achieving high performance in applications where there is a risk of breakage and cuts. 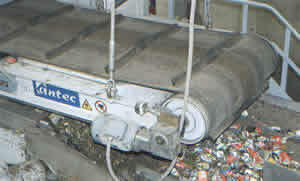 Belts with these covers incorporate magnetic separators. They are made to order, according to the working conditions of each line. 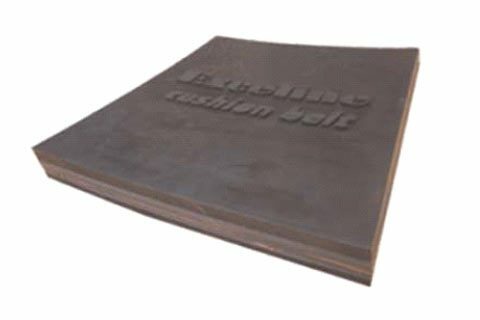 Belts specially indicated for use with shot blasting machines. 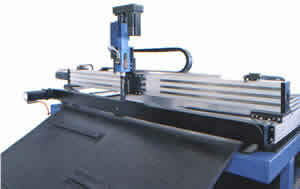 They are made to order according to each machine’s specifications. Holes are perforated in the belt with the aid of numerical control programmes in order to obtain great accuracy. With the aim of adapting Beltsiflex® belts to any special transport situation, we have developed agile construction systems which allow the installation of all types of profiles on the belt. Vulcanised by thermofusion, they can be produced to order according to specific transportation requirements. The main problem that most conveyor systems face is misalignment (often called tracking) of the conve- yor belt where the belt runs off to one side. Obstruction of the entire conveyor system due to continuous spillage of material. 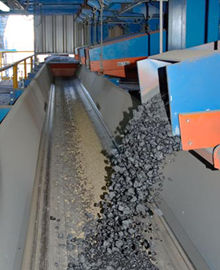 Prolonged spillage of the material reduces conveyor efficiency through belt damage wear to mechanical components and increased frictional drag thus negatively affecting production. Deterioration and damage to the belt edges shortens the belt life time. All industrial applications e.g. Port facilities. mines. foundries. chemical plants. steel plants. cement plants. power generation. minerals processing facilities. quarries etc. 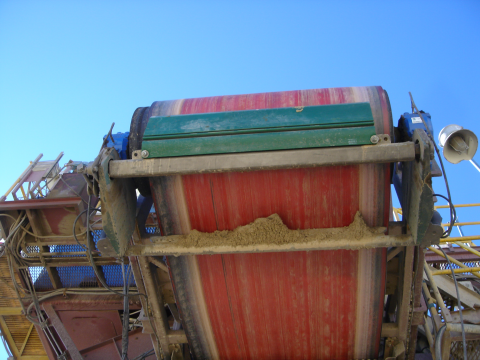 Conveyors with unequally distributed loading. i.e. where conveyors are not loaded centrally. have multiple feed points. are part loaded or overloaded at the sides e.g. due to frequent surges in feed rate. Increased stability along the entire belt length eliminating the risk of misalignment and thus preventing the early deterioration of the edges of the belt ensuring greater belt life is achieved. Drastic reduction in friction contact with non-moving parts of the conveyor structure resulting in less wear to the belt thus increasing the working life of the belt and conveyor structure. By reducing friction between the belt. structure and spilled material. the power required to drive the conveyor is reduced proportionally. In some cases it may be possible to reduce drive motor size significantly improving overall conveyor performance. Increased production capacity. Due to the increased stability in the central zone the reduced wandering of the belt brings reduced spillage of material and an associated reduction in cleaning costs. It also offers the potential to increase the troughing angle as the belt is more flexible at the edges. offering increased conveying capacity. The opportunity to work with higher troughing angles (above 45º). In certain cases the belt can reach troughing angles (close to 90º). 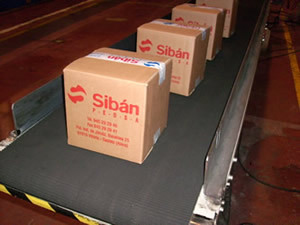 The conveyor belt is equally suited to all applications where a standard conveyor belt is used. 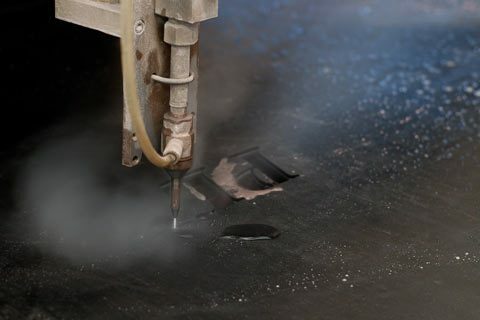 RI covers with excellent abrasion properties are suitable for tough working conditions with big impacts. The belt carcass is constructed with special rubber to absorb big impacts. This special cover contains natural rubber and other special compounds that give this belt excellent cut and abrasion resistance properties. Fabric carcass covered with rubber. 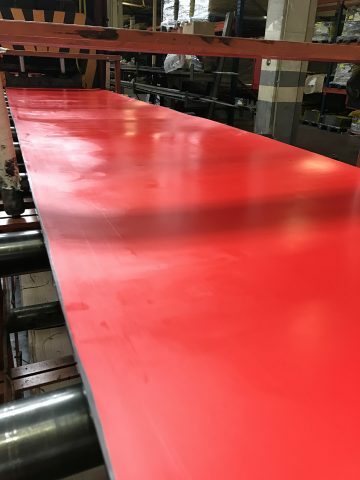 SRC-35 Belt (ABRASION SPECIAL COMPOUNT) the use of this polymer layer applied to the conveyor belt establishes a new product family that will develop this sector in a very important way. 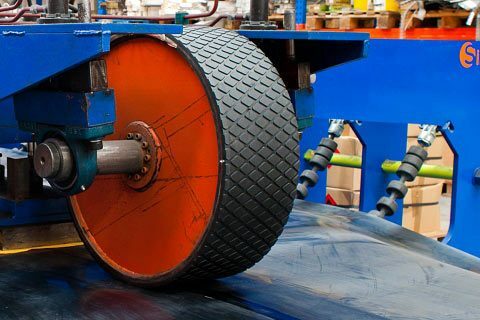 The physical and mechanical properties of the product represent an unprecedented development for conveyor belt cover properties for the toughest applications. 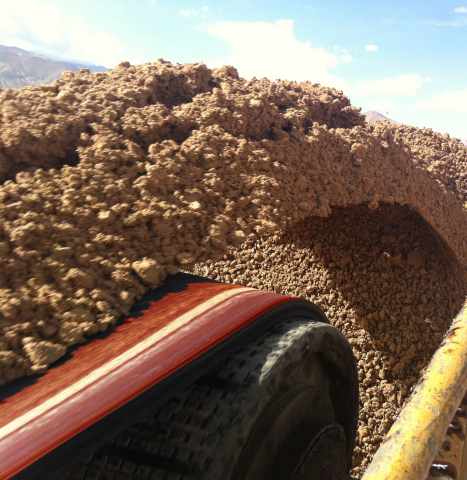 Characteristics such as the abrasion level, tensile strength and elongation at break are increased to levels beyond those that can be achieved with any type of rubber. These properties allow thinner belts to be used than a standard rubber equivalent whilst improving belt lifetime and offers considerable energy potential. The manufactoring of belts with SRC-35 (ABRASION SPECIAL COMPOUNTS) is developed according to the application requirements. The belt carcass is usually a standard construction, or can follow the design of the Cushion Belt. The SRC-35 cavers can be applied to just one cover or to both top and bottom covers. Belt dimensions are calculated and matched to the requirements of the service load, demands of the installation and client request. Manufactured according to the client’s needs and perforated with waterjet system and numerical control programmes. Manufactured according to the client’s needs we can offer belt with hot longitudinal splice up to 5.200mm.